As slaves relentlessly toiled in an unjust system in 19th century Louisiana, they all counted down the days until Sunday, when, at least for half a day, they were briefly able to congregate in Congo Square in New Orleans. There, they were free to set up an open market, sing, dance, and play music. They were free to forget their cares, their struggles, and their oppression. 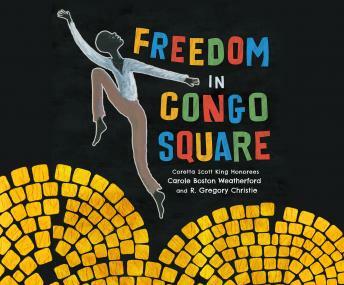 This poetic, nonfiction story about this little-known piece of African American history chronicles the daily duties of such slaves-from chopping logs on Mondays to baking bread on Wednesdays to plucking hens on Saturday-and builds to the freedom of Sundays and the special experience of an afternoon spent in Congo Square, capturing humanity's capacity to find hope and joy even in the most difficult of circumstances and demonstrating how New Orleans' Congo Square was truly freedom's heart.